While your puppy's mother and breeder are getting her started on good housetrain-ing habits, you'll need to do some shopping. If you have all the essentials in place before your dog arrives, it will be easier to help her learn the rules from day one. Newspaper: The younger your puppy and larger her breed, the more newspapers you'll need. Newspaper is absorbent, abundant, cheap, and convenient. Puddle Pads: If you prefer not to stockpile newspaper, a commercial alternative is puddle pads. These thick paper pads can be purchased under several trade names at pet supply stores. 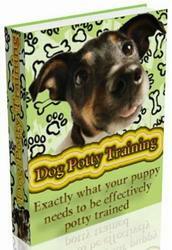 The pads have waterproof backing, so puppy urine doesn't seep through onto the floor. Their disadvantages are that they will cost you more than newspapers and that they contain plastics that are not biodegradable. Plastic Bags: When you take your dog outside your yard, you must pick up after her. Dog waste is unsightly, smelly, and can harbor disease. In many cities and towns, the law mandates dog owners clean up pet waste deposited on public ground. Picking up after your dog using a plastic bag scoop is simple. Just put your hand inside the bag, like a mitten, and then grab the droppings. Turn the bag inside out, tie the top, and that's that. Crate: To housetrain a puppy, you will need some way to confine her when you're unable to supervise. A dog crate is a secure way to confine your dog for short periods during the day and to use as a comfortable bed at night. Crates come in wire mesh and in plastic. The wire ones are fold-able to store flat in a smaller space. The plastic ones are more cozy, draft-free, and quiet, and are approved for airline travel. Baby Gates: Since you shouldn't crate a dog for more than an hour or two at a time during the day, baby gates are a good way to limit your dog's freedom in the house. Be sure the baby gates you use are safe. The old-fashioned wooden, expanding lattice type has seriously injured a number of children by collapsing and trapping a leg, arm, or neck. That type of gate can hurt a puppy, too, so use the modern grid type gates instead. You'll need more than one baby gate if you have several doorways to close off. Exercise Pen: Portable exercise pens are great when you have a young pup or a small dog. These metal or plastic pens are made of rectangular panels that are hinged together. The pens are freestanding, sturdy, foldable, and can be carried like a suitcase. You could set one up in your kitchen as the pup's daytime corral, and then take it outdoors to contain your pup while you garden or just sit and enjoy the day.